Dominion Energy Questar Pipeline, LLC is an interstate natural gas pipeline company that provides transportation and underground storage services in Utah, Wyoming and Colorado. The company owns and operates slightly more than 2,500 miles of pipeline with total daily capacity of 2,530 Mdth. The company's system is strategically located in the Rocky Mountains near large reserves of natural gas in six major producing areas, including the Greater Green River, Uinta and Piceance basins. Dominion Energy Questar Pipeline transports gas from these areas to other major pipeline systems for delivery to markets in the West and Midwest, including the Dominion Energy local distribution system serving natural gas utility customers in Utah, southwest Wyoming and southern Idaho. Dominion Energy Questar Pipeline owns and operates the Clay Basin storage facility located on the Wyoming-Utah border. Clay Basin is the largest underground storage reservoir in the Rocky Mountain Region. Through wholly-owned subsidiaries, Dominion Energy Questar Pipeline, LLC owns and operates the Dominion Energy Overthrust Pipeline, LLC in southwestern Wyoming. 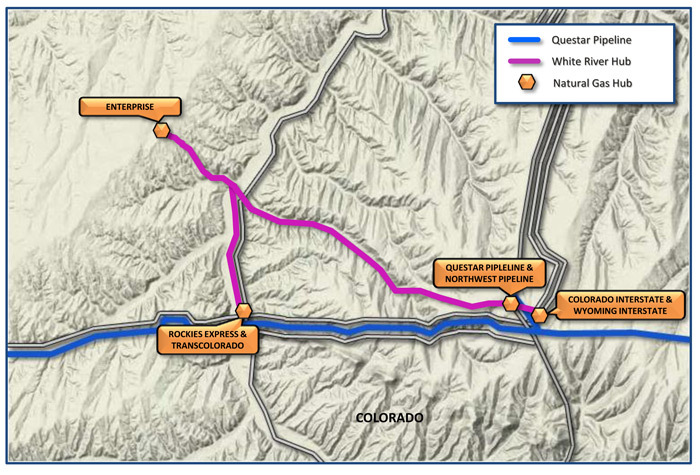 Dominion Energy Questar Pipeline also operates and owns 50% of the White River Hub providing transportation and hub services through interconnections with six interstate pipeline systems and a major processing plant near Meeker, Colorado. Dominion Energy Questar Pipeline’s core transmission system is strategically located in the Rocky Mountain area near large reserves of natural gas in six major Rocky Mountain producing areas. The pipeline transports natural gas from these producing areas to other major pipeline systems and to Dominion Energy's distribution system.